Slate is very durable, has an extremely low water absorption index, and is resistant to frost damage. 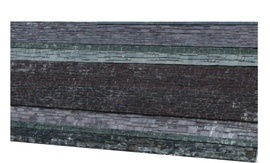 Slate used as a roofing material comes in a variety of colors. Slate is often named after the geographical region of its origin. Slate is one of the most expensive roofing materials available. It averages $10 to $20 per square foot ($15,000 to $30,000 for a 1,500 square foot roof). Slate that is very unique or thick can run up to $50 per square foot.